« Homepage / Food and Healthy Eating / Recipes / "Wolfe’s Buffalo Shrimp and Cool Cucumber Relish"
Bring to a boil and turn down to a simmer for 10 minutes Mount with butter and season with Tabasco for desired heat index. In a stainless steel mixing bowl combine all ingredients; taste and re-season if necessary. Sauce and relish yields roughly 16 large shrimp (i.e. 21/25 count shrimp). After frying shrimp in your favorite seasoned batter, lightly toss the shrimp in Chef Wolfe’s buffalo shrimp hot sauce and serve with his cool cucumber relish. 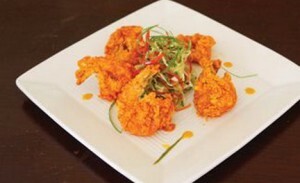 Here you can write a comment to the post "Wolfe’s Buffalo Shrimp and Cool Cucumber Relish"